Natural Plywood Folding Table Is 30 Percent Lighter Than Alternative Particleboard Core So It Is Ideal For Quick Setups Required For Hospitality Or Banquet Events. The Lighter Weight Means More Portable Solution For Home Settings As Well. The 3/4" Plywood Top With A Uv-Coated Natural Finish Is Protected With Robust Aluminum Edging And Supported By Full-Length Hardwood Runners To Ensure Extra Strength And Durability. 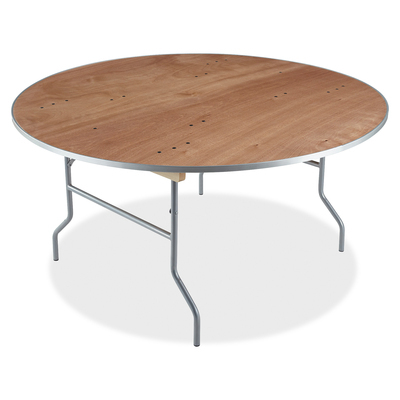 Round Table Also Features Bolt-Through Construction To Wishbone Tubular Steel Folding Legs For Maximum Support..
Natural Plywood Folding Table Is 30 Percent Lighter Than Alternative Particleboard Core So It Is Ideal For Quick Setups Required For Hospitality Or Banquet Events. The Lighter Weight Means More Portable Solution For Home Settings As Well. The 3/4" Plywood Top With A Uv-Coated Natural Finish Is Protected With Robust Aluminum Edging And Supported By Full-Length Hardwood Runners To Ensure Extra Strength And Durability. Round Table Also Features Bolt-Through Construction To Wishbone Tubular Steel Folding Legs For Maximum Support.